Responding to a post from Felicity Dale, here is my story of spending time in the wilderness. For me it spanned a ten year period and began when our friends moved on to other things but we knew that we were to stay put. It was a lonely and seemingly bleak experience. I became a follower of the Way some time in the period between 1968 and 1970. I can't pin it down to a particular time or date, there was a time when I did not believe, and later a time when I did, and between the two a process of searching and growing understanding. In late 1970 Judy (my first wife) and I began hunting for a place where we could meet other people with similar faith and a heart to follow Jesus simply and intentionally. We hunted high and low around Bristol where we had a flat, but failed to find what we were looking for. Eventually we found a little ex-Brethren meeting, Zetland Road Chapel, less than a five minute walk from our front door and we knew right away that this was home. In 1975, buying our first house in the nearby village of Yatton, we found a similar welcome and good fit at Horsecastle Chapel. After a few years at Horsecastle, we were very excited to discover other believers in the village with remarkably similar ideas to our own. We began meeting in our homes together and quite soon there were fifteen or so of us. We soon discovered the gifts of the Spirit and realised we were part of what was known at the time as the Charismatic Renewal. Eventually we left the chapel to fully immerse ourselves in this new thing that Jesus was doing. They were exciting times! But after a few years people began to join the new organisations that were beginning at this time. There was Bank House Fellowship in Clevedon, a new group in Yatton with clear leadership by a couple we knew, and several others locally. Most people were looking for leadership and structure of one kind or another while Judy and I were certain that meeting at home and led only by Jesus through the Holy Spirit was the right way to continue. Gradually we found ourselves on our own, our time in the wilderness had begun, probably by 1980 but certainly before 1985. How this wilderness time ended about ten years later is another story. But what did we learn through the experience? Several important things, I think. We learned not to depend on other people, but to depend only on Christ. This was a valuable (if painful) lesson. It's not so much that we felt let down by people, but at first we grieved over them because we felt they had lost the most important thing. It seemed to us that our friends were following other people at least as much as they were following Jesus. I know that they did what they believed to be right and with clear consciences, but neither Judy nor I could follow them there. At first Judy was very hurt, I tried to build bridges. We learned to let people move on without blaming them and without resentment. It would have been natural to return to Horsecastle Chapel where we had many friends. But we knew that was not what we were called to do. Doing what seems natural can be the wrong thing. Another useful lesson. We learned that staying where we are can be an act of obedience. Sometimes we are called to move into new and perhaps difficult situations. Sometimes we are called to remain in changing and perhaps difficult circumstances. And above all we learned the need to listen, hear, and obey. Judy and I shared Tony and Felicity's feeling that the Lord had somehow moved on and left us where we were. Even reading the Bible and praying seemed empty sometimes, yet we persevered because the Spirit had shown us we were to meet informally, in homes, and led only by him. We learned not to confuse stubbornness and faithfulness. Stubbornness comes from wanting my own way, faithfulness from wanting Jesus to have his way in my life. To those outside the situation the two may appear very alike. We learned to respect the leading that others have, even when it is different from our own. And finally, we came to see that the wilderness is a place of value. It builds character. It teaches patience. It breaks down pride and self-sufficiency. At first it seems a place of failure and defeat, but it proves in the end to be a place of new beginnings and victory. The wilderness is a place of preparation. See also: Related article on Felicity Dale's blog. It was exciting to meet with others today to pray for the town where I live. We met at a local bookshop/cafe and talked and prayed over hot drinks and a light lunch. My friend Jim invited me to a prayer meeting at Cornerstone. I was excited to discover this is another example of people obeying Jesus across organisational boundaries. Ros had suggested meetings to pray for St Neots, and in particular for the business people in the town. Jim had responded with some enthusiasm, Paul had offered a meeting place, and this was the third meeting (I was unable to go along last week as I had a dental appointment). 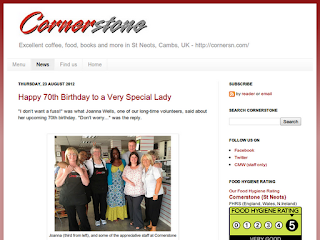 Dot also joined us, as did Paul who owns and manages Cornerstone. Jo has been involved previously but was unable to come today. People and organisations - I'm not part of any organisation, considering myself to belong to the church in the town where I live (although I meet with one of Open Door's small groups). Jim and Paul are involved at the River, Dot meets in Bedford and Ros in Cambridge. Jo is from St Marys, Eaton Socon so there are six of us from five different backgrounds. For me this diversity is encouraging and delightful and very much in line with what I believe Jesus is doing in Britain today. There is a growing and deepening trend to just do whatever we are shown to do. Our allegiance to One Leader (King Jesus) sometimes causes us to act in simple ways that were less likely in past generations when the denominations acted mostly independently. Brief notes from the meeting - We had a useful and enthusiastic time of prayer. Ros reminded us of Ezekiel's vision of the deepening stream of water coming from the Temple and the trees on either side. (Ezekiel 47:1-12) Our life depends on this river, if our supply is not from the Holy Place we will be dry and ineffective. We also thought about the Kingdom and our need to live as subjects of the King. We are only in the Kingdom if we are obedient. That's what the Kingdom is, the realm where the King rules and is obeyed. I'm looking forward to more of these Wednesday lunchtime meetings. Does anyone have other simple, encouraging examples of working together across dividing lines in the church? We all want to see the Kingdom grow and extend. We all want to reach the lost and encourage our brothers and sisters. How is this happening in your own experience? How do science and faith stack up against one another as ways of knowing the truth? Science provides truth about the physical universe while faith provides truth about spiritual things. Is there any overlap? 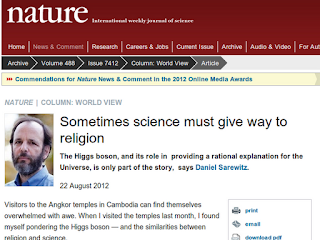 Nature has just published a short article entitled 'Sometimes science must give way to religion' by the atheist and scientist, Daniel Sarawitz. 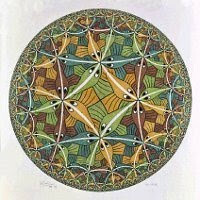 In it, he argues that there are scientific concepts we cannot really understand except mathematically. He offers the Higgs field as an example. This field provides other fundamental particles with their mass, preventing them from travelling at the speed of light. The famous Higgs particle is associated with the field, and is the evidence that such a field does, indeed, exist. Sarawitz is right, it is difficult to visualise such things, or understand them in the way we might understand that gravity causes things to fall towards the ground. The Higgs is not part of our everyday experience, falling objects are. But Sarawitz goes on to say that therefore faith is involved in accepting the evidence for the Higgs. But the early comments on his article take Sarawitz to task, pointing out that this is nonsense. They argue that accepting the Higgs is not a matter of faith, it's more a matter of accepting that the scientists involved in the discovery have track records of good science, honest hearts, and deserve our trust. The conclusions are rational and are based on evidence. I agree with them. Faith has no place in science, and evidence (in the scientific sense) has little or no place in religious belief. My career began in biological research. I have a BSc and an MSc, I understand the principles and practices of science. I am also a follower of the Way, a follower of Jesus. It's not a blind faith, I have my reasons for thinking and acting the way I do. I would argue that there is a knowledge of material things that is advanced by science building on what is already known, but that there is also knowledge of spiritual things that is given from above. Many people accept one or the other, some people accept both. To me, accepting both seems the obvious and right thing to do, and I find no conflict in doing so. I'm interested to hear your views on this. Please scroll down and leave a comment. Are science and faith incompatible? Do you have difficulties with one or the other? How do you deal with those issues? Does science show faith to be false? Must we reject science if it appears to contradict the Bible? 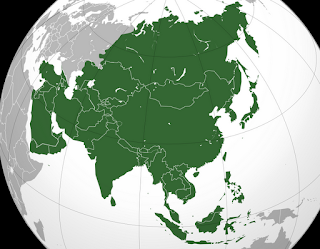 People following Jesus in Asian countries don't necessarily become part of churches in our Western sense. Sometimes they simply follow Yahshua in community as part of their everyday lives. The difference between the two approaches is a challenge to us. Andrew Jones is a church planter and a blogger - his blog is called 'Tall Skinny Kiwi'. In 2011 he wrote an article for Lausanne Global Conversation following his visit to some Asian churches. It's well worth reading again even if you've already seen it. Andrew's article simply lists eleven practices that he considered to be at the root of the Asian believers' success. The article is in two pages, make sure you don't miss the second page. I visited a number of Asian countries in 2011 and was amazed at the dynamism and commitment of the young Jesus followers. One network, in a country that I will not mention, stuck out to me as an outstanding example. They have started almost a thousand new communities, many of them multiplying into the second and third generation. And like many new movements in the non-Western world, a Sunday worship service as an evangelistic entry point for potential members has not been part of their ministry portfolio. So if they didn’t start worship services, how did they start a replicating movement of Christian communities and how do they maintain such a high level of spiritual growth? Andrew then writes a little under each of the following headings - Bible study, open houses, fringe focus, simple habits, good business products, system for rehabilitation, native flavour, daily rhythms, not outreach to but outreach with others, something for the whole family, prayer. Here's another taster, Andrew's sections on open houses and fringe focus. The people were hospitable to visitors who seemed to come at any time of the day or night. Their houses were full of young people living there while their lives were being transformed. I did not see any buildings used for worship or church functions. Bible studies and events took place in the houses, with young people sitting on carpets and mattresses, but I would not classify it as a house church movement, since there was no regular worship service to invite neighbours into. The primary influx was young people from the margins, the underbelly of society and those discarded by it, drug addicts, and postmodern sub-cultures rather than mainstream folk. I have seen this trend all over Asia including Japan. Most of the leaders I met had come from these backgrounds also. There's a desperate need for change like this in other parts of the world. But perhaps there's just as much need for it here in Britain. Some people in the West are doing similar things, here in the UK and elsewhere, but so far perhaps especially in the USA. Can we learn from this Asian approach? Is everything they do appropriate in the UK, just some of it, or none of it? Are there particular features Andrew describes that you might try in your own life with Jesus? Are you already doing some of these things? If not, why not? Could you engage in similar approaches with your friends? Could you reach your neighbours? Leave a comment. Let's have a conversation. Jesus says we are his body here in the world. He is alive so his body is also alive. We are to do the things he did (and even greater things). We are to say the things he said. We are alive, not just as individuals but as his body expressing his love, his wisdom, his authority. We are not just able to express love, wisdom and authority individually, but communally. It is not enough that you and I express our own love. It is not even enough that we individually express Christ's love. The mystery is that the church herself, the Bride of Christ, is also able in her own right to express Christ's love. We are not a bunch of loosely associated individuals, we are Christ's Bride. I am deeply troubled that the Bride is fragmented and damaged. So many different forms of church management and government compete for our loyalty. Differences in doctrine, in faith, and in tradition are everywhere. So let's take one of the many ways of understanding church and see if we can usefully extend it. Controlling DNA - Taking this a little further we might recognise that a living organism is more than the product of its DNA. There are subtle factors at work controlling how and when that DNA is expressed. For example these factors are responsible for the fact that babies in the womb do not develop ears on their legs. Every cell in the body contains the full set of instructions, but cells only act on a subset of the DNA. It's the same in the church, we all have the same DNA which is the nature of Christ, and we all partake of that one nature. Yet we are not, as Paul points out, all ears. Why not? The Holy Spirit - One factor I can identify immediately is the prompting of the Holy Spirit in the moment. How I behave is controlled, not simply by the DNA, but also by what I am hearing at this present moment. The DNA is not diffused throughout the entire body. Every cell, whatever its function, has a full set of DNA while only using a subset. Perhaps we should not expect every member of Christ to express all of the DNA. Or, even more significantly, perhaps we should not expect any member of Christ to express all of the DNA! Instead, perhaps we should expect that particular parts of the DNA will be expressed by particular individuals at particular times for particular purposes, and that each individual will do so based on constant communication with the Holy Spirit. The environment - Another important factor in living systems is the environment. The expression of DNA is affected by the environment. For a simple example consider the effect of sunshine on human skin. Too much sun causes damage - burning in the short term and perhaps skin cancer in the longer term. Melanocyte cells in the lower epidermis respond to exposure by creating increased amounts of a dark pigment called melanin. The DNA contains the instructions for making melanin, but the environment determines when and how much it is expressed by skin cells. In the church, one such factor of the environment is persecution. The persecuted church is different from the unpersecuted church. Prompting by the Spirit and environment both affect the appearance and behaviour of the church. We should not overlook these factors. Can you think of other factors that might control the expression of the the church's DNA? This is a repost of an article originally published two years ago. I think it's worth raising this subject again now because I'm still looking for an answer. I'll be honest with you - this is something that's been bugging me for a long, long time. Those of us who follow Jesus often refer to ourselves as 'Christians' or 'the Church', or in more specific cases we use the name of a particular organisation - 'I'm a member of the such-and-such church'. This troubles me because I really don't want to make any distinctions of this sort. We are all one in Christ, though we may have different gifts and abilities (Eph 4:1-7). We are one body and we should learn to see ourselves that way, not merely in terms of the Church Universal (although that is true and important) but in practical terms, in our daily lives and thinking. The Bible recognises one church in different locations, it does not recognise different churches. Paul is emphatic on this point (1 Cor 1:12-14). The New Testament distinguishes church by province, city, and meeting place. We read of the church throughout Judea, Galilee and Samaria, the church in Ephesus, the church that meets at the house of Priscilla and Aquila. The idea of distinguishing churches on the basis of leaders, doctrines or traditions is completely alien to the writers of the New Testament. In fact they always opposed any such move very strongly. I am entirely happy to be known simply as someone who follows Jesus and is part of the church in Europe, the UK, England, the East of England, Cambridgeshire, St Neots, or Eaton Ford. I'm happy to be regarded as part of the church meeting in my house, or Jim's house, or Sean's house. But there is a practical issue when a name is needed in, for example, a list. What I would prefer is to state that I'm a follower of Yahshua (Jesus) in St Neots. And if there's room, that might be acceptable but it will be confusing. So in a list like 'Eynesbury Methodist, Open Door, River Church, St Mary's Eaton Socon' what should I write? Currently I use terms like 'organic church', 'house church', or 'simple church'. But these are not accurate or complete and they act to divide - which is the very thing I want to avoid! I'd like to write 'the church in St Neots' but that will not be understood. Suggestions are welcome. Does anyone else worry about these things? There doesn't seem to be a satisfactory answer. I don't want to be seen as set apart, I want to be seen as I see myself, part of the one body of Christ here in the town where I live. But there doesn't seem to be a word or simple phrase for that! Perhaps it's better to avoid being listed and just get on with living as a follower of the King. The very existence of a list implies that the items on it can be distinguished in some way. Some new thoughts - It occurs to me that the early believers referred to their faith and practice as 'The Way'. The term 'Christian' means 'little Christs' and was applied by others in a derogatory sense. Do you think it would be a good idea to talk about 'The Way' again? Or perhaps 'The Path', or 'The Road'. Or it could be expanded to 'The Narrow Way'. Should we refer to ourselves as followers of The Way? How would that affect how we see ourselves? How would it affect how others see us? Think about the views of other believers and of non-believers. How do you suggest we tackle this naming problem? The Embankment in Bedford takes in part of the River Great Ouse from the bridge at the town centre. There are great views of the town and the park. 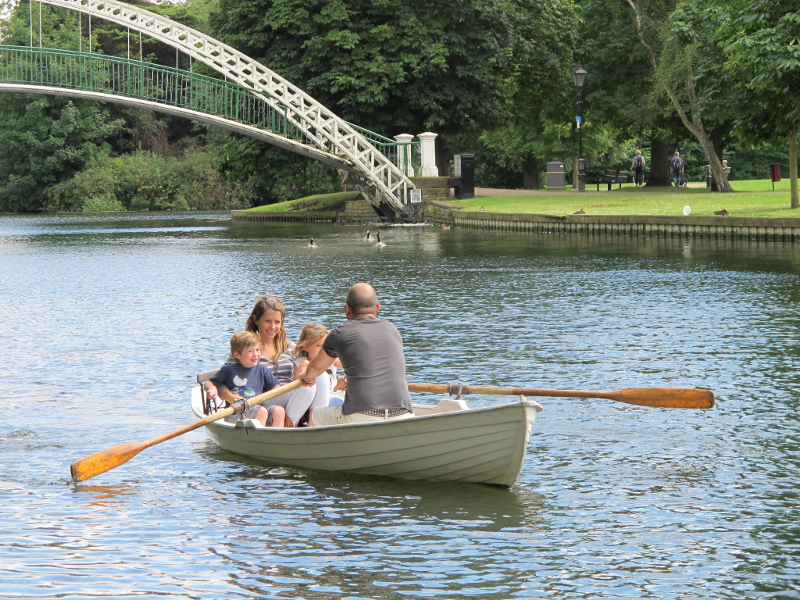 This family was enjoying the fine weather by hiring a boat and rowing up and down. I was there with some friends on a photowalk. Great fun and very interesting. You can see some of the other photos I took in my Photowalk album. What does this image say to you? There are no wrong answers. (Add a comment). Click the 'image' label below to see other image posts. Are you an encourager? Has anyone ever encouraged you? If so, and especially if not, this is for you. We can all learn to encourage and it's probably more important than we realise. Here's a good story about encouragement. Floyd McClung posted a story on his blog this morning. He writes that he doesn't know if it's a true story, but it is a story of truth. He is right about that. We are called to encourage one another. This story is about encouraging, how to encourage, what it takes to tend to a person's heart so that the growth that happens in them becomes permanent. It's a good story. We should all try to find ways to encourage those around us. No doubt we'll all find different ways to do it, but the important thing is not how I encourage, it's that I do encourage, that I am an encourager, that I have a habit and a heart to encourage. One day a teacher asked her students to list the names of the other students in the room on two sheets of paper, leaving a space between each name. Then she told them to think of the nicest thing they could say about each of their classmates and write it down. On Monday she gave each student his or her list. Before long, the entire class was smiling. ‘Really?’ she heard whispered. ‘I never knew that I meant anything to anyone!’ and, ‘I didn’t know others liked me so much,’ were most of the comments. No one ever mentioned those papers in class again. She never knew if they discussed them after class or with their parents, but it didn’t matter. The exercise had accomplished its purpose. The students were happy with themselves and one another. That group of students moved on. Several years later, one of the students was killed in Vietnam and his teacher attended the funeral of that special student. She had never seen a serviceman in a military coffin before. He looked so handsome, so mature. The church was packed with his friends. One by one those who loved him took a last walk by the coffin. The teacher was the last one to bless the coffin. After the funeral, most of Mark’s former classmates went together to a luncheon. Mark’s mother and father were there, obviously waiting to speak with his teacher. 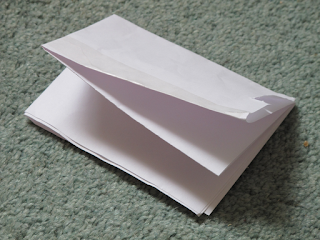 Opening the billfold, he carefully removed two worn pieces of notebook paper that had obviously been taped, folded and refolded many times. The teacher knew without looking that the papers were the ones on which she had listed all the good things each of Mark’s classmates had said about him. That’s when the teacher finally sat down and cried. She cried for Mark and for all his friends who would never see him again. The density of people in society is so thick that we forget that life will end one day. And we don’t know when that one day will be. So please, tell the people you love and care for, that they are special and important. Tell them, before it is too late, tell them while you have time. Tell them in carefully crafted but simple, heartfelt words of love why you appreciate them, the good you see in them, the love and hope you carry in your heart for them. Two visions at a recent meeting have some encouraging things to say about the future of the church. Both of them speak of something that has been destroyed, both of them speak of recovery and renewal. Donna and I and some friends visited Faith Camp at the Peterborough showground on Wednesday 1st of August. Colin Urquhart was speaking that night, a veteran from the old days of the Charismatic renewal in the 1960s and 70s. He's still as good as he ever was! He spoke about the seven 'I AM's in John. During a time of individual reflection and prayer and focussing on holiness and love, the Spirit gave me two pictures. I'd like to share them here, they are about holiness and love and the future of the body of Christ which is the church. A broken plant - I saw a plant with the leaves cut off at ground level, as if it had been carelessly run over by the lawnmower. There appeared to be nothing left, no hope of recovery, a total loss. But then I saw that there was a deep root and a tuber that were intact and I knew that stems and leaves and flowers would spring up fresh and new. And the Spirit showed me that it needed only a little time (patience) and a little rain (refreshment). The broken temple - A little later I saw the ruins of a stone building. 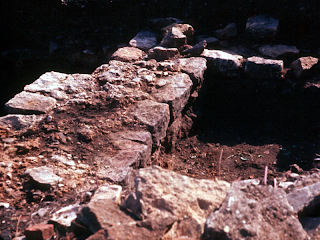 Just some broken, low walls remained, and some scattered stones. I had no idea what it represented. And as I watched the ruins were transformed into a complete building. Stone fitted against stone, timbers appeared, and the entire structure was covered in gold and fine jewels. Jesus continued to sit there throughout this process. Indeed, I realised that the transformation came about because he was sitting there. Look full in his glorious face. The meaning - I am convinced that the Spirit is saying that a time of revival and renewal is coming to the church, because Jesus is coming to the church in a fresh and extraordinary way. I believe he is also saying that we will need to be patient, that the refreshing living water is a necessary resource first. Jesus needs to be sitting in his proper place amongst the ruins before any restructuring and renewing can begin. He is already among us. He is going to sit amongst us in new ways. The church is not dead but it has been badly damaged. He is going to do a new thing (he always does a new thing). The roots of the damaged plant are still there below the surface as are the foundations of the damaged temple as is the foundation stone of the church which is Christ. So rejoice, be patient, and be full of expectation! This is a time for experiencing the Messiah's holiness and love. It is also a time for all of us - individually and together - to allow his holiness and love to pour out through us as a great flood. This flood from Jesus needs to flow between us one to another, and it will also flow out into the world. Our response - Whether I have understood all this correctly and fully or not (probably not), it would be good to hear what others think. What do these two pictures say to you? What have I missed or distorted? Have you or those you know had similar revelations and expectations? What do you think the Lord will do next amongst us? Do you see evidence for these changes in the world around you? In church life? In your own life? NASA's next attempt to land a rover on Mars will be made on 6th August. It's going to be a scary process but if it's successful the results will soon begin to stream home from Curiosity on the floor of Gale Crater. In a few days time, at 05:31 UT on August 6th, NASA will attempt a landing on Mars. The Curiosity rover is the size of a small car and weighs nearly a tonne. The objective is to gently place it on the ground inside Gale Crater. 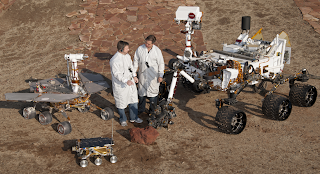 The image shows NASA staff with engineering versions of Curiosity (the large rover on the right) and two earlier generations, Opportunity on the left and little Sojourner at the bottom. 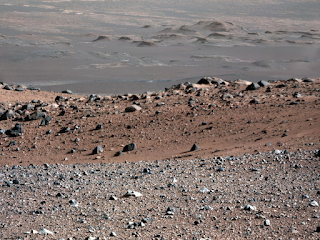 The journey from the top of the Martian atmosphere to the ground will take about seven minutes. During this time, the spacecraft has to decelerate from nearly 6 kilometres per second to zero and leave the rover in the right place and undamaged. You can see how this is intended to work 1n the NASA video 'The Challenges of Getting to Mars'. It may not work out well, although I hope and expect that it will. If so, we're in for a treat as the rover begins its prime mission, exploring the interior of Gale Crater in detail and looking for signs that the conditions might once have been suitable for life. A phone call sparked some thoughts about envy and its opposite. Envy is such a negative and destructive emotion. The opposite of envy is rejoicing with one another. We need to cultivate joy in our lives. I had a lovely telephone chat with a friend yesterday. We've only met once, and briefly at that. But we've corresponded occasionally over the years on various topics around life in general and life with Jesus in particular. One thing that we talked about today was the topic of envy. And as we talked I tried to work out what would be the opposite of envy. I decided it must be rejoicing with one another. If I envy you for your car, your wife, your wealth or good health, your education or some other blessing in your life, I am saying that I would prefer to have that thing myself, I would like to be in your place. But if I rejoice with you over your car, wife, wealth, good health, education, or other blessing, I'm expressing gladness that you have that thing. The Bible has a good deal to say about envy. Old and New Testaments agree that envy is a very bad thing. Here are a few examples. The word 'envy' appears twenty times in the UK version of the NIV. The value of joy - Let's think about rejoicing instead. Let's practice rejoicing with our brother or sister in the good things they have received. Even if I have little and you have much, why would I not rejoice with you, why would I be jealous instead? Envy is a shrivelled, mean-hearted emotion, crabby and resentful. It drives people apart. But rejoicing with one another builds bonds of peace and closeness. Envy causes a souring of relationships and blocks communication. But rejoicing with one another causes relationships to flourish like well-watered gardens and opens new depths of rich communication. Rejoicing is good for the soul, good for the mind, good for our sense of well-being. Rejoicing builds up where envy tears down. Rejoicing cements together where envy tears apart. So it's easy to see that rejoicing makes it easier for Jesus to build the church whereas envy makes it much harder. We are a temple built of living stones held together by bonds of peace; rejoicing and love are the two major bonding elements. May I urge you, if there is any bitterness or envy or jealousy in your heart, pray for it to be replaced with joy. And wherever you detect bitterness or envy or jealousy in your brother or sister, pray for them that joy might grow in their hearts instead. And where possible, pour love and good things into their lives as these may help the process along. Light is a good thing, darkness is disabling, but light banishes darkness. 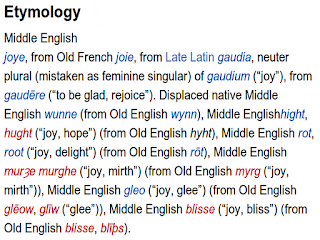 In the same way joy is a good thing, envy is disabling, but joy banishes envy. Our hearts should seek joy just as our eyes seek light. The heart that seeks joy will find it - first in Christ, then in his Spirit, then in all the good things of life, and finally even in facing hardships and difficulties and pain. In the world of music - You might like to listen to Beethoven's famous 'Ode to Joy' theme from his ninth symphony. Notice how quietly it begins as a simple melody, but then spreads eventually through the entire orchestra and grows in excitement eventually bringing in all the instruments and voices. 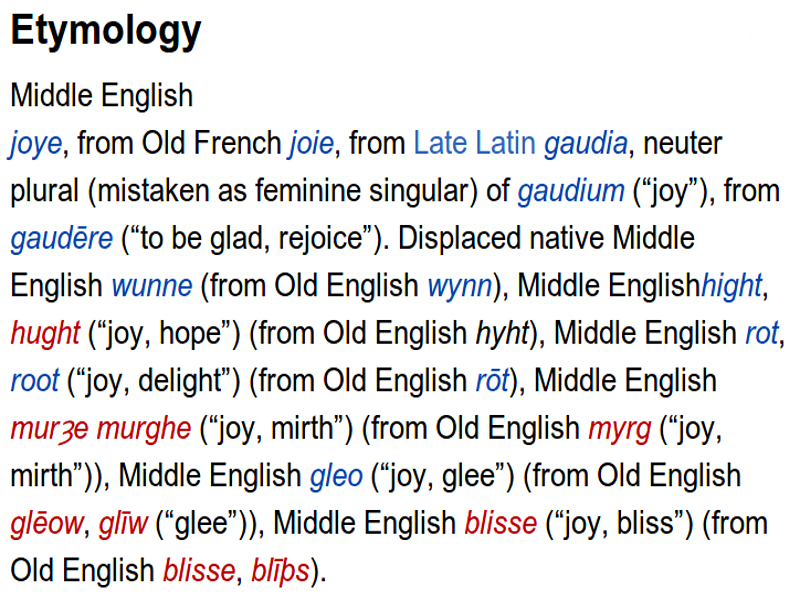 It's such a great illustration, joy may begin quietly but it's lively and thoroughly infectious. The final word - Let's give Paul the final word on rejoicing. Finally, brothers and sisters, whatever is true, whatever is noble, whatever is right, whatever is pure, whatever is lovely, whatever is admirable – if anything is excellent or praiseworthy – think about such things. Whatever you have learned or received or heard from me, or seen in me – put it into practice. And the God of peace will be with you.